Top o’ the mornin’ to ya! It’s almost time for my favorite holiday – St. Patrick’s Day! I’m not sure why I love it so much. We’re a wee bit Irish so there’s that. I associate it with a celebration of Spring’s arrival so that probably has something to do with it. Oh, and I love my Mom’s corned beef and cabbage. The whole family gets together for the yearly dinner and I always look forward to that. It looks like I’ve just answered my own question! 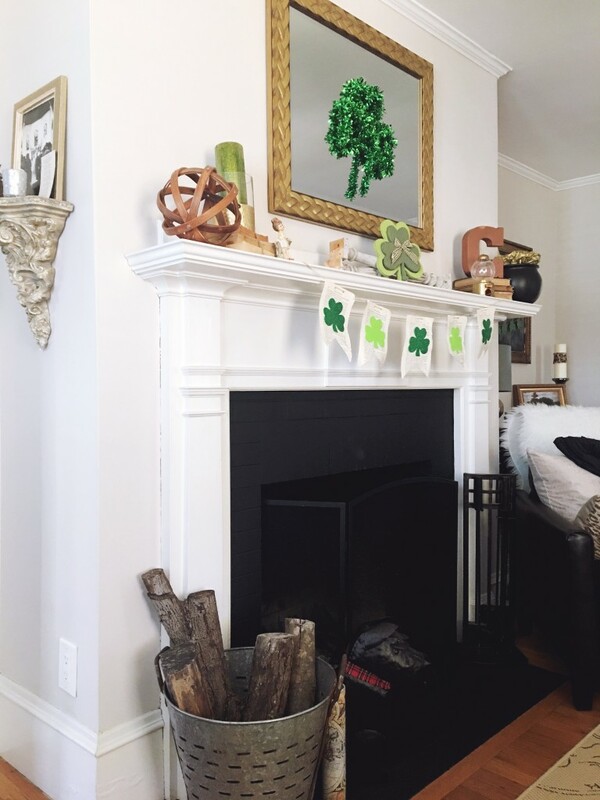 Anyway, today I’m sharing our St. Patrick’s Day décor. I don’t do too much for this holiday aside from the front door and the mantle. 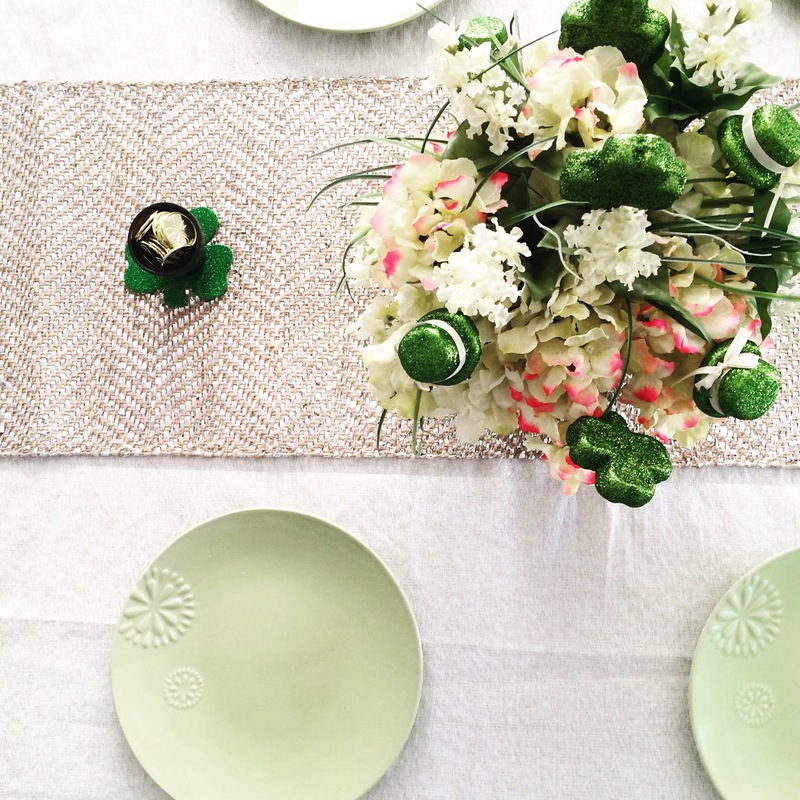 Last year I did a tablescape in our dining room but that was when we had our old table that I hated and would do anything to disguise it. It was actually a really nice table. It just wasn’t my style anymore and was too big for the space. I like to mix old with new a lot and I love mixing metallics. 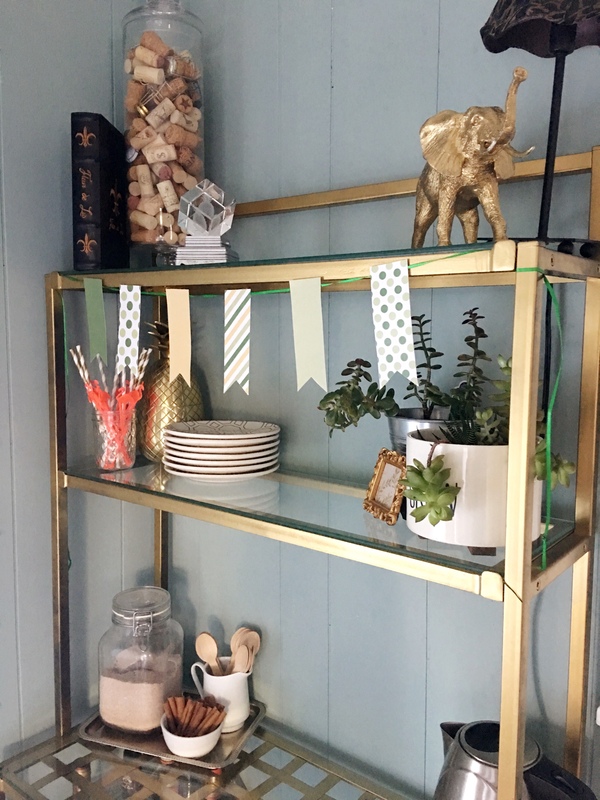 Even though gold is usually associated with SPD, I thought bringing a bit of copper into the design would really compliment the aged book pages and pops of gold. I made the book page banner years ago. 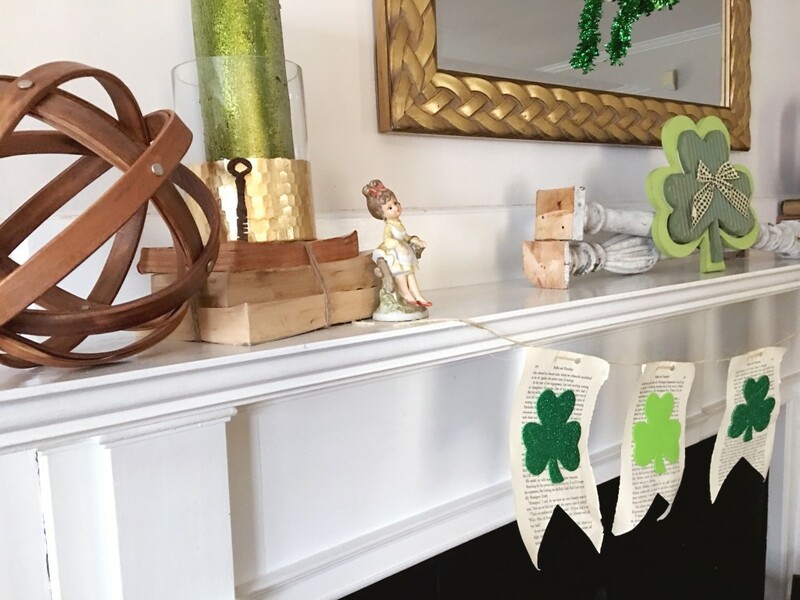 I’d bought the shamrocks at Dollar Tree, tore pages out of an old book, cut them, and then glued the shamrocks to the pages. I completed the look with some twine for the banner. Total cost: $1! This was the first year I used vintage books on the mantle for the holiday and I’m really loving how it compliments the book page banner. The little girl figurine was my grandmother’s and I believe it belonged to her mother. I would play with it every time I went to my grandparent’s house when I was little. I’m a sucker for anything nostalgic so I was delighted when my dad gave me this figurine and another one that also belonged to my Gram. I love the feel of Spring she has and had to include her in this year’s mantle display. 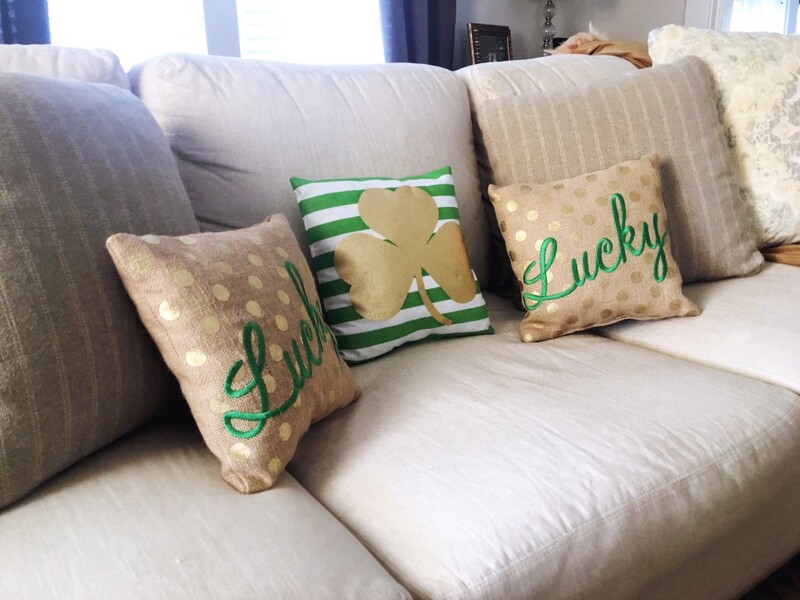 I added some pillows from last year’s Target Dollar Spot to the couch. I miss the feeling of laying on a cloud with our old couch but this couch is just so much better suited for us and the space. The smaller size and neutral color transitions well from season to season. Over on Instagram, I shared the backstory behind this piece. 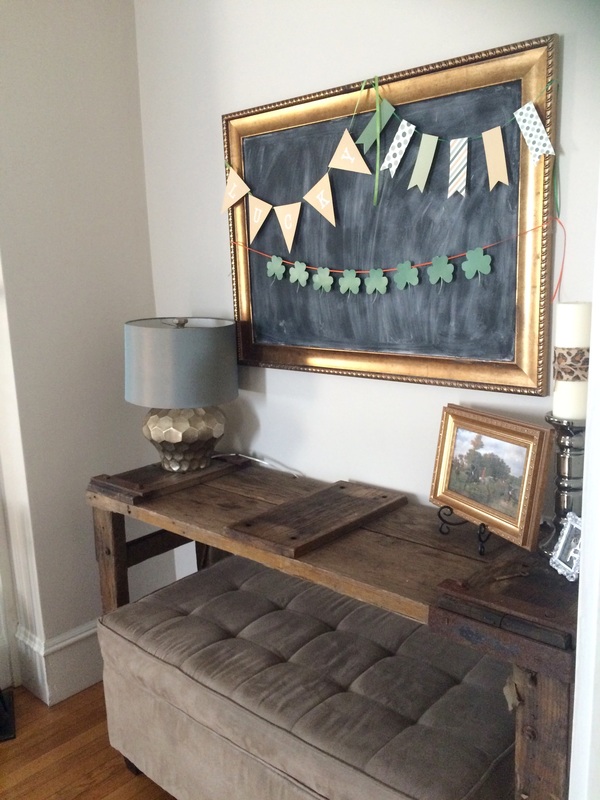 I used last year’s free printable from Ella Claire for the chalkboard. In the dining room, I used some extra banner that I had and added it to the bar. That’s it! 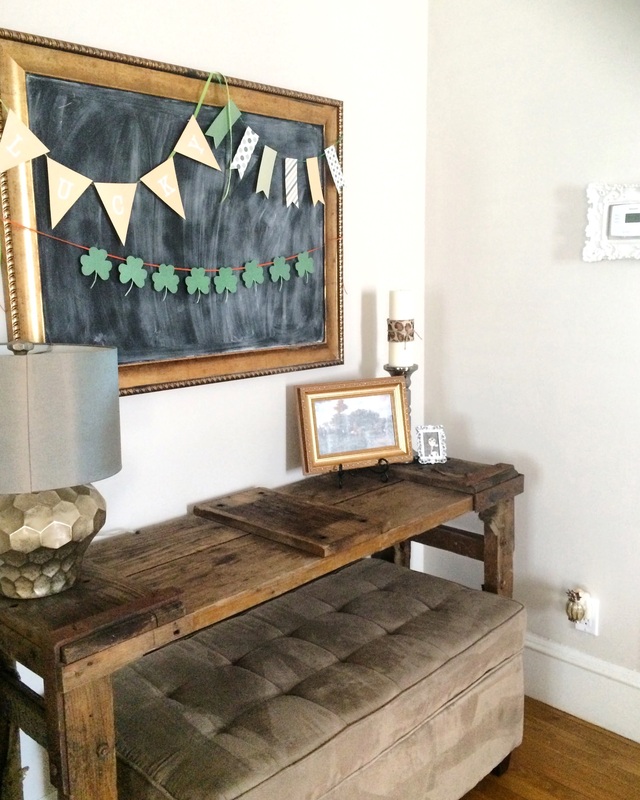 Simple decorations that will take me all of 5 minutes to take down and put away. 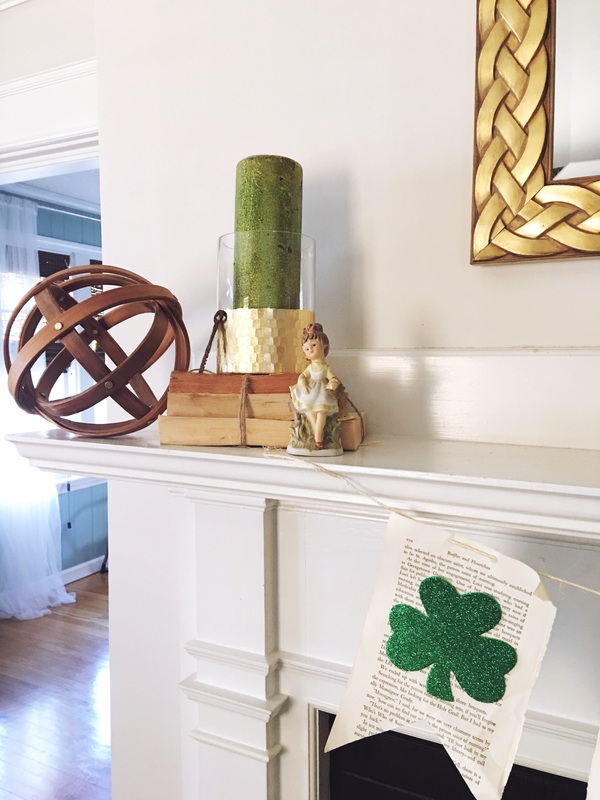 I love this season because I get to change up the décor often and easily, starting with Valentine’s Day and ending with Memorial Day. I got some great clearance deals after Easter last year so I’m looking forward to opening the tote and remembering everything I bought! You’re such a good writer, and designer!